Colorado's peak fall foliage is usually from mid-September to mid-October, and can vary by season and depend on temperatures. What makes Colorado unique? Colorado strikes aspen gold when the aspen trees turn brilliant yellow in the mountains. 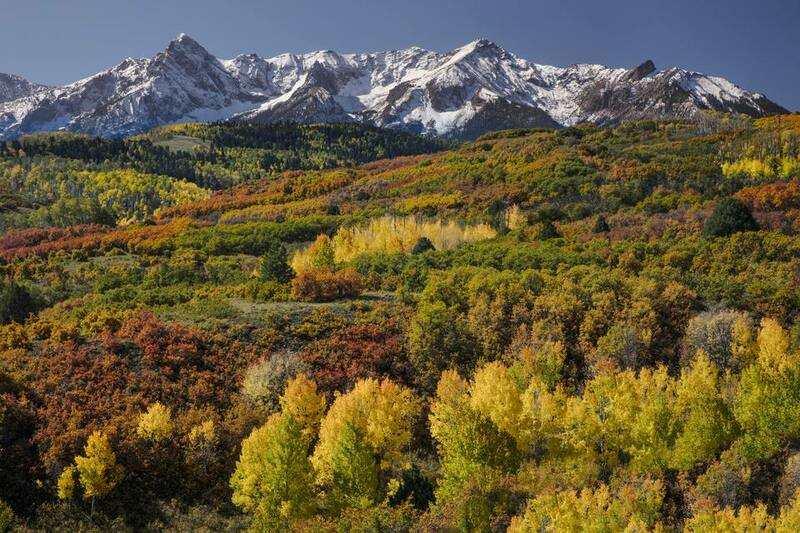 Colorado and Utah are home to the largest number of aspen trees in the U.S.
Don't miss the fall colors this year with this list of handy resources. But, what makes Colorado especially unique during the fall? The state has five different climate zones within a two-hour drive from downtown Denver, according to the city's visitor's bureau. That means Denver and its surrounding areas have one of the longest periods of fall colors of any city in the country. Also, keep in mind trees in the mountains will change color earlier than trees in the Mile High City. If you wait until Denver is awash in picturesque tones of orange and red, the mountain trees will already be bare of leaves. If you're looking for a color show in Denver, your best chance to see the changing leaves is in October to mid-November. The Weather Channel offers an easy-to-use map of peak fall colors across the U.S. The Weather Channel usually estimates peak colors will occur between late September and early October in most of Colorado. Pictured at left, aspen trees display their brilliant gold leaves. Annual park passes for all of Colorado state parks cost $70 per year, or you can pay an entrance fee of $7 to $9 per vehicle for each state park. Some state parks also charge a walk-in fee of $3 per day. The U.S. Forest Service maintains a fall colors update for the Rocky Mountain Region, which encompasses Colorado, Kansas, Nebraska, South Dakota and Wyoming. The U.S. Forest Service also breaks down the types of trees, from aspens to cottonwoods, that visitors can see in fall glory. Combine the beauty of fall leaves with the mating rituals of large elk, and you have the perfect fall weekend. Suzy Blackhurst, director of communications for the Estes Park Convention & Visitors Bureau, says dusk and dawn are the best time to hear the elk bugle. The distinctive mating call is unmistakable and sounds like a bugle's blast. Pictured at left, a male elk struts his stuff in Estes Park, Colo.
A luxury autumn getaway awaits in Crawford, off the beaten path in southwestern Colorado. "There's not a stoplight for miles," said Mary Clare Silva, director of marketing for the ranch. The 1890s ranch has been restored, and now offers a secluded retreat from city life with farm-to-table cuisine. Looking for a new way to enjoy the fall colors? Here's a few "only-in-Colorado" ways to get great views of Mother Nature's choreographed leaf show. Go tubing in Clear Creek in Golden. Yes, even in the fall temperatures are still warm enough to dip into the creek, and the snow melt has warmed up enough by September and October. The trees that line the creek will show off their beautiful autumnal colors. Take a ride on the Georgetown Loop Railroad. It's hard to truly appreciate the beauty of fall when you've got your eyes on the road. Go for a ride on a historic railway between Georgetown and Silver Plume through the trees.